As the states marched down this road from Whig tradition to federalism, New York emerged on the vanguard. This was quite by accident. It was one of the last states to adopt a constitution. Although New York’s Third Provincial Congress declared its independence on July 9, 1776, it wasn’t until April 20, 1777 that its Convention of Representatives of the State of New York (nee “Fourth Provincial Congress”) formal adopted the state’s first constitution. Before we get to the awful legacy of the New York Constitution, we need to skip ahead to the arguments made during the debate surrounding the US Constitution (courtesy of the notes taken by Robert Yates, a New York delegate to the Constitutional Convention). Here the fear of mob rule is quite evident. It is from these fruit that was born the nature and purpose of the US Senate: “to protect the minority of the opulent against the majority.” That is why, unlike the House of Representatives, which is apportioned by population and therefore allows the majority to oppress the minority, the Senate weighs each state equally, thereby preventing larger states from bullying smaller states. 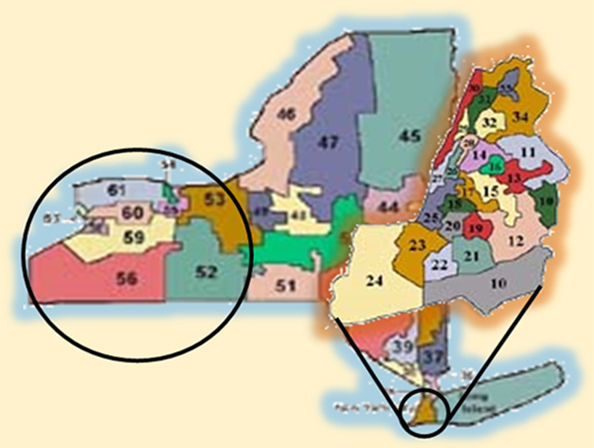 Unlike the US Senate, where each state is treated equally to prevent the tyranny of the most populous states, the NY State Senate is apportioned by population, just like the House of Representatives and the NY State Assembly. In other words, the NY State Senate is redundant. It not only fails to prevent the tyranny of the most populous counties, it magnifies it. Here’s the problem: one city – New York City – has 24 State senators. That’s more than a third of the entire Senate. The 17 counties in the Greater Western New York Region have only 10 State senators, less than have of New York City’s total. Guess who always wins? It’s hard to argue this doesn’t promote the tyranny of the majority. How much longer will this be allowed to go on? We’ll find out when they start ripping those convenient dual purpose/free kitchen garbage pail bags out of our hands come next year.